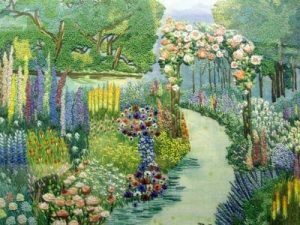 Embroidery Garden can be considered as the most beautiful, whimsical, and magical garden where the needles and the threads are the flowers which grow on the grass of an embroidery machine. Our beautiful designs have combined the passion for gardening and embroidering. DigitEMB is a place which includes incredible embroidery motifs that explore wildflowers, beautiful butterflies and sweet honey bees enjoying their nectar and a large number of various fascinating flowers. Our designs are elegantly detailed and creatively rendered. Our creative designers creatively use their mind in an artistic way and they flawlessly transform the beauty of the garden with the help of a needle and thread. What does your dream embroidery garden look like? Match the dream turn into reality by our tremendous embroidery garden designs you can also customize them. Each season has its own beauty and its own beautiful flower grows in that particular season. The flowers which bloom in the spring are Apple blossom, Cornflower, Cherry Blossom, Casa Blanca Lily, the list goes on! Just as in summer, the fascinating flowers with the pleasant smell that is lavender, tulips, and magnolia blossoms, and daffodils, tulips, are found everywhere. And of course, the little pretty garden creatures the incredible butterflies of various colors, the cute ladybugs. Similarly, flowers blooming in autumn are Allium, Freesia, Gerbera Daisy, Lily, Gloriosa, Orchid, Misty Blue, Roses, Lilly and much more! The winter blooming flowers are Pepper berry, Chrysanthemums, Evergreens, Queen Ann’s Lace, and the list goes on. We’ve a variety of embroidery garden patterns which directly reflects the beauty and variety of the garden. Flowers make everything look beautiful and better so why don’t just stitch them? We have some embroidery designs which provide a real look that you won’t believe your eyes! We provide our services with the fastest turnaround and with the cheapest price tag while maintaining the top quality to satisfy our client’s needs. Our beautiful designs have combined the passion for gardening and embroidering. If you’re a lover for embroidery garden then we are here to satisfy your needs.